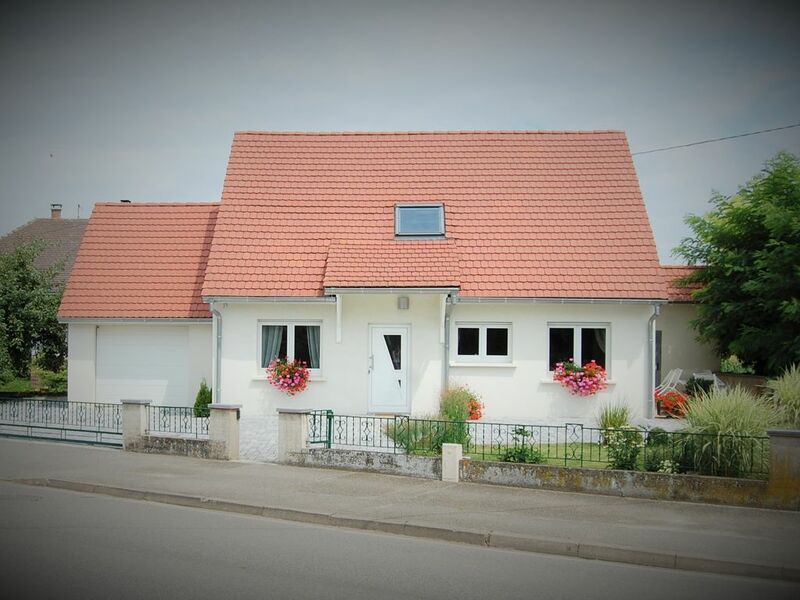 New house independent level, air conditioned, located halfway between Colmar and Strasbourg. in an Alsatian village every comfort: 3 bedrooms (2 double beds 2 single beds), living room, dining room, kitchen, 2 bathrooms, 3 toilets, mezzanine. Automated garage. Private parking, green space, equipped terrace, parasol, barbecue. Washer dryer, dishwasher, TV, ceramic hob, oven, microwave, refrigerateurcongelator. Internet access. The house was built entirely by the owners including furniture, everything has been thought for maximum comfort. A large private bathroom to the bedroom of the parents: two sinks, a large mirror, shower and WC Upstairs a beautiful bathroom with a sink, shower and toilet. A third WC is located on the ground floor. The house dates from 2011. It has an electric floor heating and air conditioning. reversible (to heat and cool the parts) The shutters are electric and the private garage. We stayed a week in this lovely cottage. I cannot praise it enough. The location is fantastic in a lovely quiet little village close to good amenities in nearby Benfeld. It is great for exploring Colmar, Strasbourg, Alsace and the Black Forest. The cottage is comfortable and very well equipped with everything we needed. Not just the normal facilities but also a BBQ, sun lingers, great garage etc. The owners were delightful. They really ensured we had all we needed to ensure we enjoyed our stay. Beautiful house in great location, with very friendly and helpful owners nearby. Perfectly placed for visiting the Black Forest in Germany, and the Vosges mountains in France. Only about 15 minutes away from the free ferry to Germany at Rhinau. Supermarket about 5 minutes away.Fantastic area for family cycling holidays, with miles and miles of safe cycle paths. Many thanks to the owners, we had a wonderful two weeks. We would still like to thank our kind and helpful hosts for the hearty welcome, delicious cake, tasty local wine and the beautiful bunch of flowers on the kitchen on the day of our arrival in Kerzfeld. and .good advice and friendliness during the whole week. The house was a pleasant surprise. It is modern and the interior is very stylish with tasteful colors like white, grey, red and wood, under the floor heating , air conditioning, good beds, bathrooms, modern kitchen and not to forget the garage. The location of the house is good. as the second last house by the village road heading trough the fields and towards "les Vosges" the beautiful mountains with vineyards and forests.The wine trail is easy to reach from Kerzfeld as well as other idyllic villages with supermarkets, and restaurants or f.ex. a larger town like Colmar.. I would recommend spending one week or more in this beautiful house for everyone. Maison agréable, avec un accueil des plus chaleureux, très bien situé. Äußerst nette und hilfsbereite Vermieter !!!!! Wir waren 2011 eine der ersten die dieses Haus besucht hatten und wurden auch dieses Mal mit Gugelhupf und Cremant herzlich begrüßt ! Wir waren beeindruckt dass in all diesen Jahren das Haus nichts von seinem Charme verloren hat. Sauberkeit und Komfort lassen keine Wünsche offen ! Für Ausflüge ist der Standort bestens geeignet ! Aber auch zum Entspannen ein lohnendes Ziel ! Wir werden sicher ein 3. Mal unseren Urlaub hier verbringen ! Cottage in an Alsatian village between the Vosges and the Rhine in the Alsace plain halfway between Strasbourg and Colmar 15 km. from the German border. The cottage is situated 12 km away. the wine road not far from Obernai, favorite tourist attraction in the Lower Rhine .The Alsatian villages are famous for their fleurissements and Christmas markets. The Hochkönigsburg and Mont St Odile are particularly popular sites, also find places of pilgrimage. The europaparc Rust in Germany is 18 km away. The Inn of Ill-starred in Illhaeussern is 25km.